This past year was my most successful year in cycling and overall fitness. My numbers are listed below, and I'm quite happy with them. I rode all the planned climbs, and as a bonus, I rode the climb of my dreams - Stelvio. Be consistent - you don't bang out huge efforts without training huge amount of time. So work on your effort regularly, even religiously. Try, fail, repeat. Then crush it! - You'll fail the climb. You'll fail the speed test. Work more, then return to the climb and the speed. Eventually you won't reach it, you'll crush it! Challenge yourself - Put large challenges with deadlines in front of you. You are never too old, too unprepared to do them. Just work every day towards the challenge. Work with the stronger, faster, younger, better - you don't get faster riding with people who are slower. You may not be able to drop them, but you'll work to be almost as good as them. And that means you've made a huge improvement compared to everyone else. You get a lot of respect from everyone for not giving up. Like you, I am very excited for 2016. I have met many of my goals for 2015. What I really want to do is what you suggest, translate the success that I have experienced on the bike to my career. I started my own blog about cycling this year. While I completed a lot of cycling this year and exceeded my expectations as far as weight, my goal is to experience that same success with my online business. We all create goals for ourselves. Some of us use a coach, or an app, or a community to help us achieve our goals. I've only recently discovered how to apply these same techniques to my professional life. 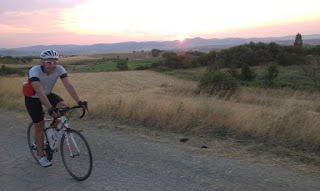 On the bike, I am going to complete a century ride (160km) this year. I am going to start generating an income with my online business. My greatest goal for 2016 is to spend more time with my children. I have a final job interview next week that will ensure that I have a schedule that will be much more conducive to being present for my kids when they need me. 2016 will be a powerful year! cima online courses is proved really very beneficial for me.I could save most of my time and could utilize that properly with online practice Tests Academy which is specialized for CIMA. Its always good to start small if your goal involves cutting out a bad habit which has developed over many years. You can always break out your goals into smaller goals. Being patient is also a quality which helps you achieve your goals faster. You will see that if you do not get discouraged easily then you will see progress which boosts your enthusiasm towards achieving your goals. Progress does happen but it takes time. Dumpsprofessor.us is getting famous day by day among the candidates of CIMA Certifications. You can practice your knowledge and improve your weak points through using online testing engine. This testing engine works as an exam simulator that will give you awareness and understanding of real exam settings. You can claim your money back in case of dissatisfaction.